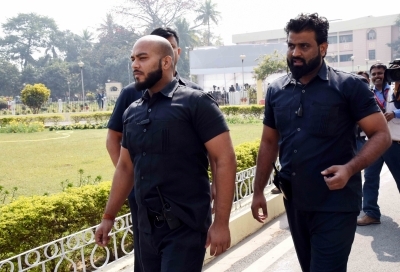 Patna, Feb 13 (IANS) Questions are being raised about security arrangements inside the Bihar Assembly after RJD legislator and former minister Tej Pratap Yadav's armed private guards was seen roaming inside the Assembly premises on Wednesday morning. Tej Pratap, the elder son of RJD chief Lalu Prasad, had arrived at the state assembly to participate in the budget session that started on Monday. However, what came as a surprise to many were his six armed private guards, who were caught on camera roaming inside the premises, in violation of the Assembly security norms. When questioned, Tej Pratap clarified that he and his guards had arrived at the assembly to do a reality check of its security arrangements and also demand official security for himself. "I have to keep private guards for myself as I have no police security cover," Tej Pratap added. However, Director General of Bihar Police Gupteshwar Pandey told the media, "I have asked Patna's Senior Superintendent of Police Garima Malik to investigate the incident" and added that action would be taken if the RJD leader is found guilty. Tej Pratap had hit the headlines last year when he filed a petition for divorce from his newly-married wife, Aishwarya Rai. It is believed that his family has tried its level best to convince him to withdraw the divorce petition, but failed much to its embarrassment.